The Swiss jeweller, Piaget, has been making high-quality luxury watches and jewellery for the past 145 years. Founded by the innovator, Georges Piaget, in the Swiss Jura mountains, the brand has grown from a workshop in the small village of La Côte-aux-Fées to become a highly respected brand that is recognised all over the world. If you’re looking for loans on Piaget watch pieces or are thinking, “How can I pawn my Piaget watch in London?” then read ahead about the services that the experts at New Bond Street Pawnbrokers can provide for you. Worn by Hollywood icons such as Jacqueline Kennedy Onassis, Sophia Loren and Elizabeth Taylor, Piaget has established itself as a respected company, due in part to its constant innovation and commitment to excellence. Through the generations, Piaget has remained dedicated to creating advanced designs for the contemporary era while remaining faithful to its Swiss origins. A Piaget watch is a timeless piece of jewellery and expert engineering, which makes it a worthy investment for any buyer. Each of their watches embodies a sleek, elegant style with an element of understated glamour that is unmistakable. If you’re looking to release the value of your assets without committing to pawning your Piaget watch, our team will make sure you get the highest capital possible for loans on Piaget watches at our award winning pawn shop in Central London without any stress or hassle. Our experts will take into account the manufacturer and model of the watch, its age, availability, condition, provenance and demand for the item in order to ascertain a suitable loan. Loans can be repaid at any point during the term established in the contract. Do take a look at our contract terms for further information. 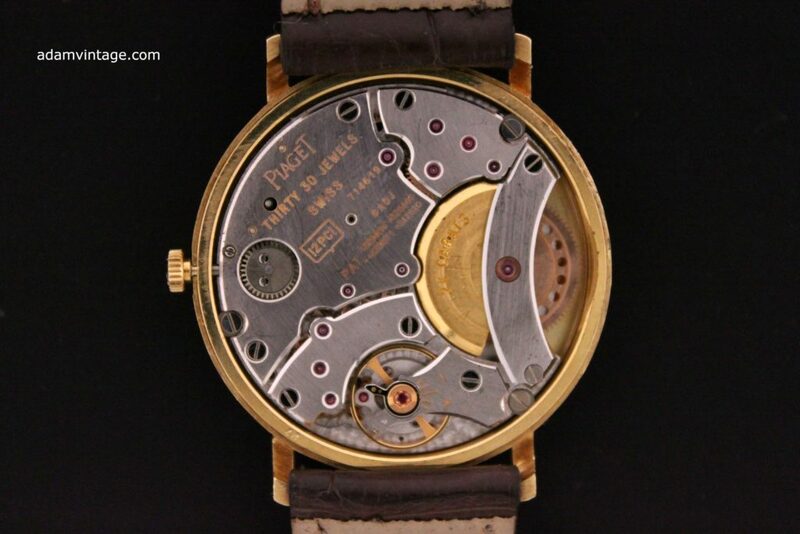 I want to pawn my Piaget watch: how do I do it? If you’re wondering, “How can I pawn my Piaget watch?” then we make that process easy for you. If you want to sell your Piaget watch for cash up front, then we can conduct a full assessment of your piece in person to ensure that we offer you the best price for it. The iconic Aura watch, introduced by Piaget in 1990, is made with 277 individually cut diamond components, which weigh a total of 71 carats. This stunning piece is limited edition, and typically goes for the highest amount at auction. Three Aura watches have sold for $365,000 (around £283,946), $378,200 (£294,215) and $384,000 (£298,727) since 2014 at Christie’s auctions. In 2015, the Polo – containing 165 baguette-cut diamonds (17.58 carats) and 426 brilliant-cut diamonds (7.84 carats) – was sold for $270,000 (around £210,042) at a Christie’s auction. This piece also had the world’s thinnest flying tourbillon, at 3.5 mm.